The Upper House kicks-off the festive season with an array of gourmet offerings and special room benefits. Café Gray Deluxe delivers elegant Christmas set menus with all the trimmings and hosts an all-new family-style sharing feast in the warm and inviting setting of the Sky Lounge. Dine on the gastronomic New Year’s Eve Gala Dinner and countdown to 2019 with specular views of the fireworks and Victoria Harbour. Snuggle up with the Festive Season room package and enjoy a winter getaway at The Upper House. Eat, drink and be merry as Chef Gray Kunz serves up delectable modern European cuisine with a sprinkling of festive flavour at Café Gray Deluxe. Delve into sweet and savoury pastries inspired by flavours of the season including decadant Foie Gras Coupe with Mulled Wine Gelée and Gingerbread, Truffle and Mushroom Gougères, creamy Eggnog Cheesecake with Blueberry and Cassis, and Chocolate and Ginger Log with Blood Orange and Coconut. Select from the classic tea offerings or for a little festive tipple, add on a traditional Mulled Wine, Eggnog or a glass of mini-Lanson Brut Champagne. A stellar dining experience awaits in Café Gray Deluxe on Christmas Eve and Christmas Day. Begin with the delicate Velouté of Artichokes and Oscietra Caviar with Raviolini and Macquarie Island Sea Bass En Papillotte with Calamansi Beurre Blanc. 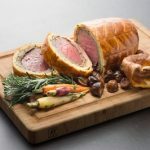 Choose between the robust Crisped Duck Breast “Calvados” or the succulent Beef Wellington with Truffle-Foie Gras Sauce for the main course. 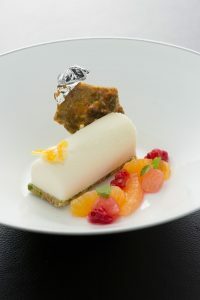 Wrap it all up with Tangerine Semifreddo with Nougatine-Cranberry Compôte or Chocolate Délice, Huckleberries with Gingerbread Crumble. Christmas Day Lunch and Dinner 4-course at HK$995 per person (12pm – 2:30pm, 6pm – 10:30pm) Wine pairing HK$800 per person A limited à la carte menu will also be available for dinner. Cosy up fireside in the Sky Lounge with a new family-style sharing menu for groups of eight or more. Savour the mouthwatering Coffee Rubbed Beef Striploin, Free Range Roast Chicken, delicious sides of Buttered Carrots, Braised Red Cabbage, Chestnuts and Pearl Onions. Chocolate and Passionfruit Baked Alaska completes the meal. Choose from a wide selection of beverages including barrel-aged cocktails. Set against the panoramic backdrop of Victoria Harbour, Café Gray Deluxe creates the perfect atmosphere for the New Year’s Eve countdown. Delight in an exquisitely designed Gala Dinner menu featuring Cold Smoked Mount Cook Salmon Fleurettes, King Crab Claws and Lobster Ragoût, Roasted Pigeon with Foie Gras Emulsion, Braised Wagyu Beef Cheeks and Seared Filet Mignon, Chocolate Marquise with Williams Pear and more. Join the countdown and enjoy an unforgettable firework show from Cafe Gray Deluxe on level 49 of the hotel. The party continues in the Sky Lounge with music and drinks till late. Vegetarian menus available upon request. All prices are subject to 10% service charge.